The cost to consumers for medicines has always been a matter of concern. Most of the people in our country consume, on an average, INR 100 value of medicines. With condition and severity of the disease, the amount spent on medicine per person can vary anywhere between INR3,000 to INR10,000 per month. The government has, therefore, amended a legal framework that asks the doctors to prescribe generic medicines. Any medical practitioner, who does not follow the same will have to face legal consequences, which may also include going behind the bars. The matter of concern here is, for doctors, who are habitual in writing prescriptions by brands may find a bit of hurdle to write generic medicines on the very first attempt. The ideal solution for this use of­ specialised prescription writing software that automatically prompts for generic drug details. As we all know, a generic drug is a medicine on which patents are expired. They are either sold as branded or unbranded products under their generic names. However, their intended use, strength, quality, performance, dosage and route of administration remain the same. After the legal intervention, the market is now gradually including generics. The tough part for doctors is that it is literally impossible to remember all of them. The good news is that automated prescription writing software can include them easily in their database and suggest as and when making the prescription. Again, if we consider in software point of view, being new in practice, not all the medical writing software have yet included generics in their database. however, the good part here is that India’s first prescription writing software, Prescription Pad has already done the job well in advance. 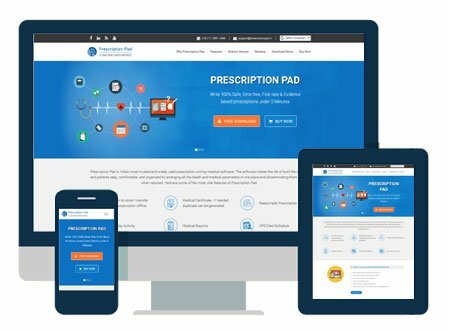 With a view to encouraging the practice of generic drug prescribing, Prescription Pad has by now included more than 3,000 names in its database. Now, doctors can effortlessly prescribe generic drugs to their patients. The beauty of the software is that at the time of finally printing the prescription, the names of all generic equivalent of the prescribed drugs automatically appear. Day by day, Prescription Pad is constantly adding more and more generic drugs in its ever-growing database. The database of generic drugs is being compiled directly from the drug monographs of the manufacturers. The same is being authenticated by the authorities in the industry such as British National Formulary, PDR of USA and Martindale book of pharmacology. Doctors can be best assured of its usefulness and safety of the generic drug written through Prescription Pad as the software provides all vital information like drug dosage, mode of action, precautions, side effects, drug’s indications and contraindications. Prescription Pad aims at making medicines affordable by all and thereby, helping the government implement its policy framework at a large scale. Doctors using this software can also help the society and the larger section of the poor by bringing it into their habit to include generic medicines to the final prescription.